under an impossibly lit night sky, lit not by a silvery moon but a glowing painter's palette splashed carelessly across the sky, a hearbeat of blue light lulls the island to sleep. 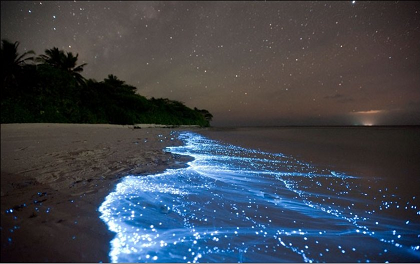 the waves break on the shore with every pulse of blue light, tracing the outline of the island with the shimmer of bioluminescent plankton; an outline demarcating the the known, and the mysteries lying deep beneath the sea. it was on a night like this that the twins were born: one with eyes so dark and so deep, they hide the secrets of the universe; the other with eyes full of joy, the sun rises everytime he laughs. the twins were inseparable opposites; Dawn and Dusk, Mirth and Solitude, Pensiveness and Passion, Imagination and Reality, Coherence and Chaos. one kept the island's beauty a secret; the other revealed its impossibility. because at night, the twins come out from their tiny hut on top of a rocky outcrop, gingerly managing the carved steps on the side of a steep cliff down to the powdery white beach below, with their mother in tow. in the shallows, the children will try to catch the perfect cup of saltwater between their tiny hands, and wait until the water goes still and reflect the stars above. the other will then pluck the star from the cupped saltwater and put it in their pockets. and when their pockets can no longer hold more, they would race back to their mother, who, with a patient smile, waits for them on the shore. everywhere i go, i carry a piece of paper with your name on it. it was from a precarious time in the past when everything hung in a balance. a time when things started to become not what they seem. a time when colors had different names. a time when you branded me as a monster, and i saw everything since from a monster's eyes. this little piece of paper was my ticket to see you in your most vulnerable state. and this, i think, might have been the reason why i kept it all these years: to remind me that you are, after all that has been said and done, human. because ever since then, so many lines have blurred and so many boundaries have become arbitrary. colors bleed out of every object's outlines. "good" and "bad" became convenient labels to things we want and we do not want to do. life became trapped in the interstices; half in, half out, unable to quite get past a chaos of colors, yet cannot seem to get back into that inane, monochromatic state of simplicity. at the middle of it all, my memory of you and what you are, have somehow become estranged. phantoms in a blistering smoky twilight. sallow images under streetlights. long-winded conversations trapped in dreams. your eyes, your lips, play mischievous games of hide and seek in other people's faces as they pass me by. because there is one boundary, one demarcation line that has been clear all along; the boundary between what is yours and what is mine. though one-sided in its acknowledgement, i keep it in mind to always veer away from your side of everything, lest the mere proximity shatter all that i have worked for. but at times i cheat. i try to trace a step or two into your direction, into your realm. i always have a ready alibi as to why i am there. but the real reason is not really to see you, but to test those acrid waters if they still burn the same way they usually do, if those spots still painfully throb the way they used to. because after what has happened so many years ago, something broke. and it was never been the same ever since. i hold on to what reminds me of your humanity, your frailty. and doing that, as an extension, mine. i roam these dim streets seeing things like monsters do, communing with tracks and vestiges of shadows from the past still lingering fresh after all these years. you gave me this little piece of paper, a ticket into a world of monsters. it needs to return to its owner; it has some stirring stories to tell about the sights it has seen. She appeared out of nowhere one day and slowly and surreptitiously installed herself as a permanent fixture in the busy public market. All we knew was that here was another addition to the vagrants that roam the marketplace day in and day out; an addition to the "nalisu-an ug pangisip"(loose-minded) in formal terms. But everybody referred to her as another "bag-ong nabuang"(who just recently went nuts). But what made her remarkable was the way she was. She looked between 40 to 50 years old, but her movements and demeanor were very fine: an ingenue under the scrutinizing eye of society. And she was clean and dressed well for a vagrant: changes of paisley blouses and colorful pastel dresses everyday, always with an umbrella, a bag, and a handkerchief in tow. Despite her being unusual from your everyday hobo down the street, some would still manage to make fun of her, and even make dismissive, disparaging remarks on her fragile and innocent nature. But eventually, the novelty and the newness of "Ms. America's" existence wore off and everyone let her be, sashaying about with her tote bag and umbrella in tow; a colorful, flowery presence in the middle of the chaos that commerce brings. One day, that chaos was broken by a loud shriek and ahouts at the second floor of the Market Administrator's office at the very mouth of the public market. As passers-by and concerned individuals came up to the office to check what the commotion was all about, there was Linda, the Assistant Market Administrator, alone and terrorized, tears, snot and spittle all over her face. She shouting madly, flailing arms and legs to not let "Ms. America" near her. But Linda never got better. Laid off from work because of her condition, she stays at home in a constant state of wide-eyed terror, always telling everybody to not let Ms. America get her. Doctors diagnosed her of PTSD (post-traumatic stress disorder), and another said it was schizophrenia. Still, everybody could not help but ask, whatever happened that day? Unsatisfied with the doctor's answers, Linda's family quite expectely sought the help of the "mananambal"(folk doctor) in the area, and he had some astounding things to say. Linda was passed on the curse of a princess of the "dili ingun nato"(otherworldly). The princess, or so the old man said, was exiled from wherever she came from due to a grave offense. Only when she was treated the same way as she treated others of her kind will the curse be passed on and she can go back home. Word spread about the old man's tale, and suddenly everybody remembered how Linda, with her large stature and quick tongue, bullied the timid Ms. America every time she saw her; this to the laughter of the people around them. She commented on how out-of-place the vagrant was with her dresses. She made snide remarks about how Ms. America was saying that she should act more her age. It was much later that people remembered the stoic and even submissive expression on the vagrant's face as Linda went on and on about her tirade. And what of "Ms. America"? What became of her? After that incident, nobody saw her ever again. The last time anyone saw her was on that fateful day, gingerly climbing up the stairs to the second floor of Market Administrator's office, still seemingly timid and neat in a flowery paisley and pastel dress. nursing a broken heart, he went back to that place that circumstance once almost forced him to call home; that place where people's skins were darker than their eyes. he wanted to once again find solace in their wisdom and their uncanny ability to reduce reality into simple, somber sentences. just a few days back, in the heat of a traffic altercation, a piercing pain on his chest led him back to his doctor. after a series of tests and even more tests whose names he could not remember, less even spell, his doctor muttered, "your heart is not pumping enough blood as it should. it looks as if it's tired." hence the break from city life and the mad rush of everyday necessary routines. a visit to the village elder, the most powerful of them all, confirmed his suspicions of his very own denial. after a moment of silence as the old man listened to his pulse on his wrist, he looked up and said, " dong, your pulse is not well. it's slow, weak. slow, as if it is bidding it's time. tarrying, like it's waiting for something, someone to come back." his eyes had a secret color that can only be seen on either dawn or twilight. at that magic moment when Light and Darkness grapple with each other in their never-ending dance for supremacy, his eyes then would have the color of the palest cinnamon, glowing and bursting into an ember brown the more you stare at it, like how the number of stars in the sky burst their numbers the more you observe them. and when the battle in the sky has been decided and won, as sudden as a snap the glow disappears. his eyes go back to their normal state: human and vulnerable. when she saw it the first time, a friend thought it was a door to the Maze that contained his Minotaur of half-formed passions and unresolved delusions. she thought it would lead to an answer to some unspoken questions of his inability and insatiability. but after seeing it once too many times, it was another friend who saw it as a window to a secret space that he frequented: a narrow alley, a hidden curb, an overgrown pathway, a shadowy street. it was in these quiet spaces that a new universe, hiding in some of reality's secret folds, is silently being born. what sends shivers down his friend's spine is knowing that an entire universe is trapped within him. everyone knows that windows always work both ways: his eyes when they glow might not just offer a view in, but also for the Others inside him, a view out. inexplicable to the outside world for the private jokes shared with just a few people. but now the outside world will become a bit more confounded, a bit more vague; a quiet link between what happens from without and what happens from just within the hand's grasp will be lost. and with the passing of time comes the passing of words that complete and give color to moments. and when everything is punctuated by a single dot at the end, always, always, it will always leave you longing. the tiny trinkets hanging on your door screaming for your attention will always be left unnoticed. you always leave as suddenly as you come. fingers dirtied by charcoal, a maddening version of reality from its tips; you are the Dark Horse rampaging the undulating terrain of my mind. you draw the most intricate faces with the most intricately soulful eyes, pulling out strings of unknown emotions from your own forgotten past. but that was how you did your drawings, and it was always a wonder why, while trapped in your own little world in simple sneakers, dirty shirt and tattered denims, you always drew with a smile. did you know that i tore my pants that night when we climbed over your fence and into your mom's bougainvillea, semi-chased by your ugly dog who did not liked the idea of being stepped on while he was sleeping at 3 in the morning? i never told you, but one spike got naughty and snagged my pants. those were my favorite pair. but the heck, your dog can eat it, even my sneakers, anytime. and speaking of your dog, remember the time when you turned white because your dog just buried its nasty fangs on my leg? my now 25-centavo-sized scar is still as clear as the memory of your face when you saw my leg bleeding. you were mumbling about hospitals and rabies while i was just sitting there, smarting with pain. and blurred pain was all i can remember of those days tagged under 'uncertainty' when we used to greet each other good mornings every single day. i did not know what it was for, or why we were doing it, or even what it meant. i had a few thoughts i kept to myself, but keeping them to myself did not allow them some space to roam so they just stayed there, round and round in my head. because it's quite strange how in different points in time you can have so many faces, so many names. but always, just a 'friend'. to some, rain washes away the dirt, the grime, and the memory accumuated during the day, revealing a clean surface ready for yet another round of abuse. it's all this city ever does best. no one sees what happens after all the washing and wearing. nobody talks about where everything goes. no one knows and no one wants to find out. in other parts, rain brings terror to the hears of many. those who have seeen its fury fear what its unrelenting torrents will take next. whose dreams will be washed away by the watery rampage? whose memories will be buried in muddy graves? wreaths of grieving flowers floating on a brown sea. makeshift crosses and stone markers stand on the bottom of collapsed hillsides. collective loss is remembered, lifestories are retold. heavy rain is pounding on my windows. i'm going outside to catch myself some words. one night, a creature of contradiction buried its fangs into my chest, making my heart skip not a few beats, leaving behind tell-tale marks that asked not a few questions about the nature of order and chaos. in some dark alley, a harbinger of chaos strayed me into a labyrinth of streets in that unexplored city full of throbbing memories. it whispered some strange stories: spies being sent out to see the comings and goings at someone's door, secret departures and undeclared battles, and surreal abandonment in the name of one single precious moment. once, an impossible monster made me think of possibilities just waiting at the tips of my fingers, of the necessities of wandering to know where we belong, of leaving so that we can have a reason to stay. but i too am a creature of contradiction. and since my reality is expressed in a complicated theory of too many knotted strings, i use my tongue to write the wrong words in my palate. i use my fingers to send out signals i do not mean. he knew there was something different the very first day he noticed it. it started when he saw his just-departed mother roaming around the house, occasionally giving him a glance and gliding away. but he thought that it was by the grace of Allah, an answer to his prayers that he could see his mother even for just one more time. but this time his heart skipped beats every time he saw her like that, with equal parts of fear and yearning. "you have a wing, but the other pair is missing," the tambalan told him in front of his father and his sister, as the old toothless husk-of-a-man pressed his palm on the boy's forehead. he motioned close to his ear and whispered, "but you will get it when your father passes away". that day was the last that he saw of his mother, and in one of her glances he saw her smile at him. what happened after was equal parts of horror and good luck. he dreams of death, and as his warning always go unheeded, death visits people close to him precisely as he dreamt it. aware but helpless, he would sometimes stay quiet in his waking hours, pretending not to know that those are going to be an aunt's last laugh, a brother's last smile. trying to escape, he goes from one place to another, seeking refuge from his torment. it seemed whenever he goes and calls it home, lives get better; a new car for a relative, booming business for a sister. but he absorbs everything else; bullets, broken bones, and an tip of a knife in a dark street corner one rainy night. as he laid there bleeding and alone, he asked, "what of my other wing, father?"